Jonathan Zimmerman has always had a heart for the environment. That love for environmental health gradually grew into a passion for safety. Receiving a Bachelor’s and Master’s Degree from the University of Findlay in Environmental, Safety, and Occupational Health, Zimmerman entered the workforce working for small manufacturing companies helping them ensure proper environmental health. It wasn’t until he transitioned to a position with Sara Lee/Hillshire Farm in 2001 that he began working as a safety professional. 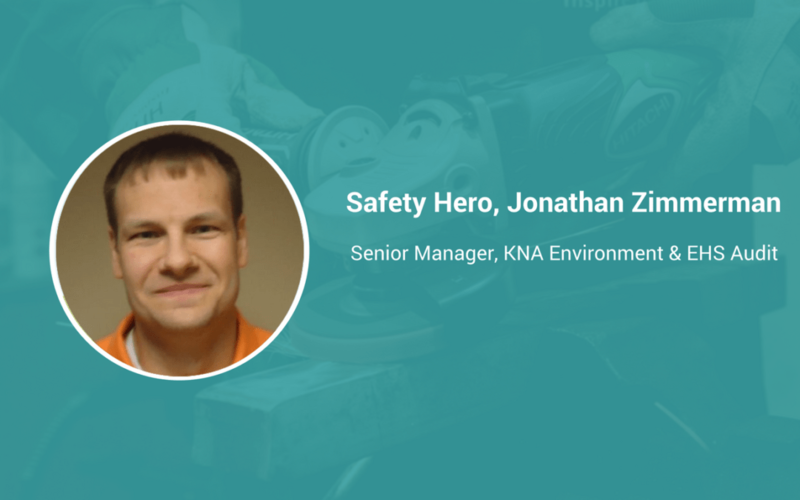 20+ years into his career, Zimmerman is a senior leader in Environmental Health and Safety field as a Senior Manager of KNA Environment & EHS Audit at Kellogg’s. He’s been a featured speaker at countless conferences and currently serves as a Regional Vice President for the American Society of Safety Engineers. I loved science as a kid and throughout high school. I’ve always been interested in the environment. I decided to pursue a degree in Environmental Health so I went to the University of Findlay. After my Master’s Program, I worked for the EPA and was then recruited by Sara Lee. The role they assigned me combined both Environmental Health and Safety which I enjoyed. 20+ years later, I’m still doing it! Being a good communicator and a good listener. Safety leaders don’t have desk jobs. They have to be out on the floor or in the field, listening to employees, hearing their concerns and ensuring that they get addressed. Those are the most important skills for a safety leader, period. Every incident that I hear about, or am involved with, impacts me. When something goes wrong we have to ask “what could we do better?” It doesn’t matter if it’s an incident that occurred on my watch or an incident that occurred somewhere else. I always seek to learn how we as an entire profession can improve. Safety is a way of life – it’s not something that you can switch off. You view the world differently, and you’re always looking for ways things can be improved or made safer. Professionally, you have to be available at all times, and willing to help at all times. It can be lonely, and a thankless profession, but it’s all worth it when everyone goes home safely at the end of each shift. Being enthusiastic, passionate, and humble all at the same time. I’m committed to doing the best I can for the people I work with. I don’t care about anything other than ensuring the safety of those around me. I wish there were a way to quantify the safety incidents that DON’T happen. A way to show the dollar amount saved at a company by the prevention of incidents each year. If there were a way for us to calculate all of those things that didn’t happen, organizations would prioritize safety above all else.